Hello ninebullets. It’s been a while. Hell, some of y’all probably don’t even know who I am. I am Autopsy IV, the founder of ninebullets.net. I have been in some version of “retirement” for around 2 years now as the site has shifted ownership a few times. So, why am I back you ask? Well. Sometimes you hear an album so good you get viscerally pissed off when you admit to yourself that, in all reality, it will get heard by a criminally small amount of ears. 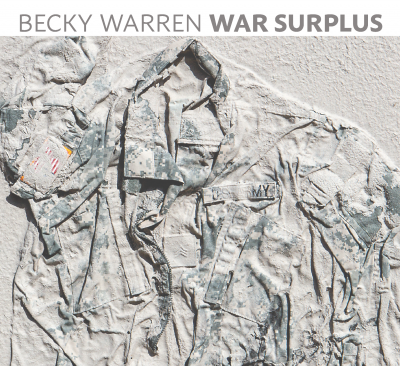 It was that anger that pushed me to start ninebullets at all and it is that same anger that bubbles up after listening to this new album by Becky Warren that brings me back into the fray. However fleeting that appearance may be. Some albums are collections of moments of inspiration turned into songs. While they might share a common theme due to the proximity to one another in the writer’s life when they were written, the commonality is strictly happenstance. Some albums, the dreaded “concept album,” are written with the purpose of telling a story. Some succeed. Most fail spectacularly. While War Surplus is, in the strictest of definitions, a concept album it also falls into the third category of albums; albums that were lived. War Surplus tells the story of Scott and June. Two star crossed lovers separated by a war deployment and ultimately torn apart by the person that came home from that war. It’s a story Becky Warren lived first hand having waved goodbye to her husband a mere week after their wedding as he shipped off to Iraq only to meet a new person upon his return. Ultimately, their story ended the way many a vets story ends; divorce. In the years between, Warren, almost gave up writing completely but found her voice and a renewed purpose a couple of years ago and set off upon the arduous task of mixing her real life experiences with some fiction to make an album that is likely both cathartic for her and essential listening for us. In the end, War Surplus tells a very real story playing itself out daily in regular America. I won’t bore you with the stats. It’s a story Becky lived in real life. She’ll tell you this is a “concept album” but I will counter that it’s a memoir edited enough to make sure it rhymed. Thanks so much, Willy Miller! It’s real good to read a review from you again, Autopsy. I’ll definitely be checking this album out. Glad you’re back A6. Becky Warren has my attention.